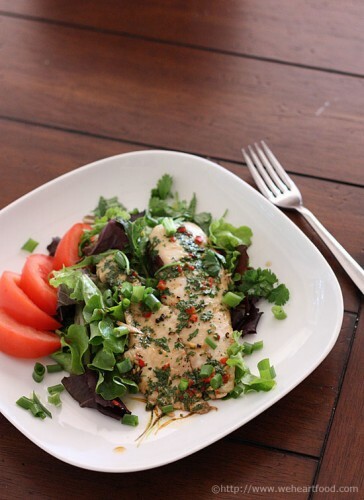 I came across this baked tilapia dish on the kitchn, and thought it would work well as a salad. Man, was I right! Not only that, but the asian-flavors marinade, made with white wine, soy, and sesame oil, makes a great warm salad dressing. This is a super-quick, super-simple meal that we’ll definitely be adding to the rotation. This might be one of my favorite ways we’ve prepared tilapia. I agree — it’s so delicious. That sauce is awesome. I didn’t even think about using it as the salad dressing until I pulled the pan out of the oven. It just smelled incredible — the wine, the ginger… so aromatic. I love the green onions and extra cilantro on top. Me too. I don’t think I’d change a thing! Heat the oven to 475F. Pat the fish dry and season lightly with salt and pepper. Place in a glass baking dish. Chop the pepper and garlic, and grate the ginger. Put in a small food processor with the soy sauce, white wine, sesame oil, and cilantro. Mix until blended. Pour the sauce over the fish, pressing the solid ingredients down into the fish a bit. Bake for about 8 minutes, or until the fish flakes easily and is cooked through. Divide the salad greens between two plates. Remove the tilapia with a spatula and place half on top of the greens on each plate. Drizzle the fish with the marinade left in the pan. Serve with warm, crusty bread. This entry was posted on Sunday, July 20th, 2008 at 8:42 pm	and is filed under Asian, Main Dishes, Salads and Light Soups. You can follow any responses to this entry through the RSS 2.0 feed. You can leave a response, or trackback from your own site. tried this great tilapia last night. it was superb. thanks for the great recipe. just stumbled onto your website recently and look forward to tryting more, especially that salmon chilli! Isn’t it great? I love how simple it is to make. We’ve had it as a salad, or over brown rice or Israeli couscous.